Low Yat is the place go to buy electronic and high-tech stuff like computers, laptops , computer parts and accessories, cameras, mobile phones, blanks discs etc. Sungei Wang, located in Bukit Bintang, is the oldest shopping complex in downtown Kuala Lumpur. The connected BB Plaza was shutdown in 2015 because of the MRT construction to make way for a new high-rise building. The Pavilion is another addition to the already densely populated shopping district of Bukit Bintang in Kuala Lumpur. It opened in February 2008 and the Pavilion Elite wing opened in 2017. The chic mall houses mostly designer stores, a Golden Screen Cinema complex and the popular food court - the Food Republic. Giant shopping Mall in Bukit Bintang with 10 floors, IMAX theatre, Golden Screen cinema, a huge bowling alley and a theme park with a roller coaster. Shopping Mall in the famous KLCC complex (Petronas Twin Towers). 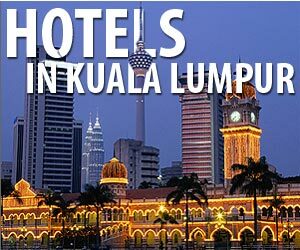 Mostly upper price designer stores, TGV cinemas, KLCC Park, KLCC Aquaria, Kinokurnya bookstore. Wet Market und Market for cheap items of all kinds, especially aquarium and hi-fi equipment along Jalan Pasar in the Pudu area. Poshest Mall in KL at the Marriot Hotel on Jalan Bukit Bintang. This mall is all about style and worth a visit just to look at the different interior designs. The new Gardens (opened in 2007) and Midvalley Megamall are shopping Malls under the same management in a mixed development called Midvalley City a few km south of downtown. Shopping Mall in Bandar Utama, Petaling Jaya (PJ). Giant Mall Shopping with an old and a new wing about 20km south-west of downtown KL. Another huge shopping complex in Petaling Jaya (Mutiara Damansara). It includes the malls The Curve and Ikano Power Center plus adjacent Ikea and Tesco that are all interconnected. Shopping Mall in Bukit Bintang housing mostly fashion stores. KWS is a giant wholesale shopping mall for fashion, textile and accessories in the wholesale district near Hang Tuah station. There are spectacular views over the city from the top floors. Viva Home is shopping specialised for homeowners with furniture, DIY / hardware and home decoration / accessories shops. Shopping mall strategically located in KL Sentral / Brickfields between KL Sentral train station and the Monorail station. Pedestrian strip mall with fashion boutiques, bistros, cafes, signature culinary and service retailers. KL city walk is located along a 500m long strip between Jalan P. Ramlee and Jalan Pinang, near the Twin Towers.